DIGHTON, Mass. – When the state tournament rolls around, it’s not records or seeds that matter anymore — it’s execution. Despite being forced inside for practice the past two days, and a five-day break in-between games, 10th-seeded Oliver Ames showed no rust in a 5-2 win over second-seeded Dighton-Rehoboth, the defending Division 2 State Champions. The Tigers connected for 10 hits — all singles —and had runners on base in all innings but two. Dighton-Rehoboth registered seven hits — also all singles — and put a runner on base in all but the final inning. After pitching just 14 innings during the regular season, sophomore Matt McCormack earned the win for Oliver Ames. He allowed two runs in 5.1 innings of work, scattering seven hits with one strikeout. Despite starting the season on JV, McCormack impressed in his appearances for the varsity squad and earned the trust of head coach Joe Abarr to get the start on the road against the defending state champs. “I had a lot of faith in him after how he’s handled himself in big games against some good teams,” Abarr said. “He threw a great game against New Bedford late in the season so that gave us a lot of confidence in him. Cam Johnson and Sam Burr connected for back-to-back one out singles in the top of the first inning, with Johnson reaching third but Falcons’ starter Thomas Roache got the third out before any damage. D-R’s offense got going early two with consecutive singles to start the game but McCormack got a key strikeout, a line drive out to center and an infield ground out to escape unscathed. OA’s offense continued its aggressive ways in the second inning and it paid off. Matt Muir’s speed forced an errant throw, allowing the junior to take second with one out. A single from Chris Pearsons put runners on the corner, and Pearsons stole second to put two on. Newman laced one to center, forcing a diving catch, which allocated Muir enough time to tag up for a sac fly. Kyle Gagliardi (2-for-4, RBI) ripped one into the right field to bring Pearsons home from second and give OA a 2-0 lead. The Tigers had a lead off single in there third inning, but couldn’t do anything with it. The Falcons put a runner on third with one out in the bottom of the third but a shallow pop up to center and a grounder to short with Muir flipping to Mitch Goulet at second for a close force out got OA out of the jam. Newman led off the top of the fourth with a walk and Gagliardi record his second hit of the day to put runners on first and second. Johnson laid down a perfect bunt to sacrifice the runners over but instead, the throw from the catcher eluded the first baseman. The ball stayed in play in foul territory, allowing both pinch runner Will Hogan and Gagliardi to score and Johnson to advance all the way to third. Two batters later, Goulet delivered a one-out single to bring Johnson in and put Oliver Ames up 5-0. “When we got that sac bunt down…when you do the fundamental things right, if you force their hand, mistakes can happen, it’s high school baseball,” Abarr said. “I thought our guys did a nice job of handling it. The Falcons had an immediate response in the bottom half of the fourth inning. A lead off single from Dallas Noons, a one-out single from John Chrystie and a walk to Joseph Reed loaded the bases for D-R. OA tried to get the force out at home on a chopper up the first base line but the throw was off the mark and the run was safe. Steven Silvia lifted one to center for a sacrifice fly but McCormack got a line out to center for the final out to limit the damage to two runs. Muir reached second in the fifth inning with one out but OA couldn’t cause any further damage. D-R earned a two-out walk in the bottom half but that was all. Chrystie led off with a walk and took second on a wild pitch. A single put runners on the corners and forced Abarr to his bullpen, bringing in junior Michael Mulrean in relief. Pearsons fielded a grounder to third cleanly and he fired home and Newman got the tag for the force out. Mulrean then induced a fly ball to left to get out of the inning. Mulrean retired the Falcons in order in the bottom of the seventh inning to finish off the save. 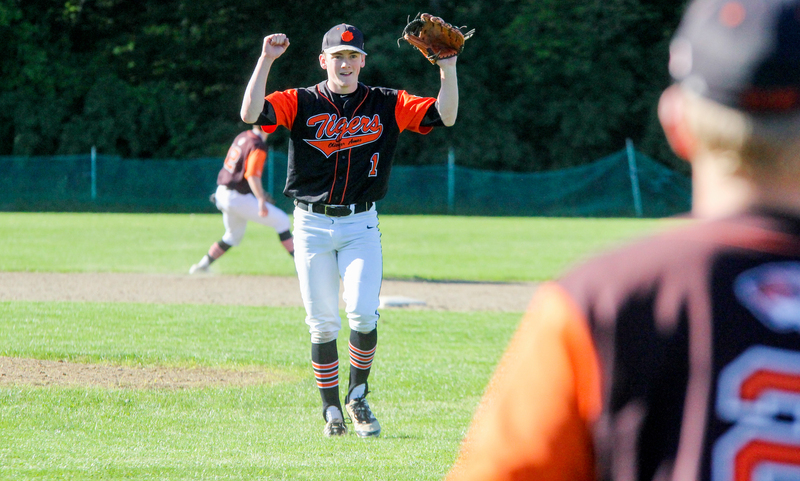 Oliver Ames baseball (14-8) advances to the D2 South Semifinals and will take on 11th-seeded Westwood (13-8) on Thursday at 7:00 at Rockland High School. Attleboro, 1 vs. Bishop Feehan, 3 – Final – Attleboro senior Tyler McGovern allowed just two earned runs in six innings of work, but Feehan escaped with the win. McGovern struck out six. Matt Callahan went 3-for-3 with a stolen base and scored the Bombardiers’ lone run of the game. Foxboro, 3 @ Dedham, 0 – Final – Senior Colin Thoener tossed a complete game shutout, earning the Warriors a key Division 3 win over Dedham. Theoner scattered six hits, walked three and finished with six strikeouts to earn the win. With the win, Foxboro qualifies for the postseason through the Sullivan Rule. Mansfield, 4 vs. Braintree, 10 – Final – Mansfield got off to a good start with three runs in the bottom of the first inning, but the unbeaten, two-time defending Super 8 champions Braintree flexed its muscles with five runs in the second to take the lead and never look back. Max Boen went 2-for-4 with a run and an RBI, while Kyle Moran, Anthony DeGirolamo and Cullen Anastasia each had an RBI. Aidan Cahill and Zack Peterson each went 1-for-3 with a run scored. Oliver Ames, 6 vs. Falmouth, 5 – Final – Falmouth scored three runs in the top of the seventh to take the lead but Oliver Ames scored three runs in the bottom half to walk off with a the win. Senior Kyle Gagliardi had a two-run double to knock in the tying and game-winning runs for OA. Nick Zwerle went 2-for-2 with three runs scored in his first game back from injury while Cam Johnson went 2-for-4 with a pair of RBI. Sam Burr was solid on the mound, allowing just two runs in six innings of work while striking out three. Taunton, 4 vs. Coyle & Cassidy, 2 – Final – Coyle took the lead in the top of the fourth, but Taunton responded with three runs in the bottom half to take the lead for good. Senior Jimmy Hoye (two runs) knocked in the tying run and Jacob Crawford and Jack Moynihan both drew walks to bring in Taunton’s second and third runs. The Tigers added an insurance run in the bottom of the fifth. Junior Tyler Medeiros earned the win, allowing just two hits without issuing a walk in 5.1 innings of work. Danny Keogh earned the save with a 1-2-3 seventh inning. Oliver Ames, 4 vs. Coyle & Cassidy, 1 – Final – Oliver Ames picked up its first win of the season on the back of sophomore Kayla Georgeu, who allowed just three hits in a complete game effort. Georgeu struck out two with just one run allowed while Rachel Han provided strong defense with seven put outs. Freshman Katie Abreu went 2-for-3 with an RBI and two runs scored and Caroline Mahoney went 2-3 with two RBI and a run scored to pace the offense. Junior Sarah Tetrault added an RBI and junior Lexie Campbell had a stolen base and a run scored for the Tigers. Stoughton, 1 vs. Milton, 3 – Final – Shannon Flaherty threw five innings without allowing an earned run, but picked up the loss in the second game of the doubleheader. Jordan Lyons had a pair of hits for the Black Knight and scored their lone run. Stoughton, 6 vs. Milton, 4 – Final – Gina Carafa struck out 16 for Stoughton and earned her fourth win of the season in the opener of a doubleheader with the Wildcats. Jordan Lyons went 2-for-3 with a triple, two runs scored, and two stolen bases. Taunton, 5 @ Dighton-Rehoboth, 6 – Final – The Tigers rallied with three runs in the sixth inning to cut the D-R lead to one, but couldn’t avoid their first loss of the season. Courtney Fisher allowed two earned runs and struck out four for Taunton. Jaime Brown had three hits, including an RBI double in the sixth, and MacKenzie Handrahan had two hits and two RBI, both in the sixth. Canton, 13 @ Norwood, 3 – Final – Canton junior Charlie O’Connor was in control at the face off X and senior Michael Pigeon dominated at ground balls as the Bulldogs picked up a big win on the road. Senior Ryan Lodge had a team-high five goals and three assists to pace Canton offensively. Freshman Chris Lavoie netted his first career goal in the win and O’Connor notched two assists. Freshman Jack Connolly made seven saves in net for Canton. Foxboro, 6 vs. Norwell, 5 – Final (OT) – Foxboro built a 3-0 lead through the first three quarters but Norwell stormed back to tie the game at 5-5 and send the game into overtime. Foxboro senior Colin Spinney scored his second goal of the game less than a minute into overtime to lift the Warriors. Brendan Tully and Bobby Yerardi also scored two goals apiece for Foxboro while Jake Addeche made 10 saves in net to keep the Clippers’ offense at bay. Franklin, 18 vs. Westford Academy, 5 – Final – Junior attack Eric Civetti netted a team-high seven goals and had one assist as Franklin rolled past Westford Academy. Senior Packie Watson netted two goals and had three assists and Chase Tanner finished with four goals and one assist. Sophomore Jacob Alexander won 21 of 26 face offs and Connor O’Rourke made six saves in net. North Attleboro, 4 @ King Philip, 5 – Final – King Philip built a 3-1 lead by halftime and held on for a narrow non-league win over North Attleboro. KP head coach Jamie Stefanini said John DeLuca (two assists) put forth great effort on both sides of the ball for KP. Tim Watson paced the Warriors’ offense with three goals and one assist. Paul Macrina made 11 saves in net for KP. For North, Tommy Lindstrom had two goals and one assist, Zack McGowan and Hunter Sarro each scored once and Jack Dakin, Nick Moore and Jason McNeany each had one assist. Tom Lockavitch had four ground balls and Dan MacDonald made 15 saves in net. Mansfield, 12 vs. Braintree, 6 – Final – Mansfield junior Hunter Ferreira outscored the Wamps himself, netting seven goals with two assists to pace the Hornets. Danny DeGirolamo (assist) and Sam O’Connell each added two goals for the Hornets, who advance to the semifinal round of the Chowder Cup. Cullen Murphy added a goal and an assist for Mansfield. Grant Milas and Mick Debreuil played well defensively in front of Sean Powers (eight saves) in net. Milford, 8 @ Stoughton, 9 – Final – Stoughton celebrated its first ever home varsity lacrosse game with the program’s first ever varsity win, edging out Milford in a non-league game. Seniors David Cellucci and Jon Lessa each found the back of the net three times to pace the Black Knights’ offense. Sean Doherty added two goals and AJ Scott netted one for Stoughton. King Philip, 9 @ North Attleboro, 17 – Final – Mackenzie Rosenberg led the way for the Rocketeers with five goals and a pair of assists. Julia Dakin had a hat trick and Katie Lindstrom added three goals and an assist. Emily Schromm had seven draw controls for North. Taunton, 6 @ Sharon, 20 – Final – Alex Rabb was the top scorer for the Eagles with four goals. Emma Eberhardt, Amanda Klayman, and Sabrina Robbins each had hat tricks in the win. King Philip, 4 @ North Attleboro, 1 – Final – King Philip came away with a clean sweep of singles play and also grabbed a win at second doubles in a non-league showdown with North. Cole Ginter won 6-0, 6-0 at first singles, Blake Ginter won 6-3, 6-4 at second singles and Martin Matous won 6-0, 6-0 at third singles. The team of Marco DiStefano and Aidan Ignatius won 6-2, 6-3 at second doubles. North Attleboro’s Daniel Zhang and Ben Pfeffer won 7-5, 7-5 at first doubles. 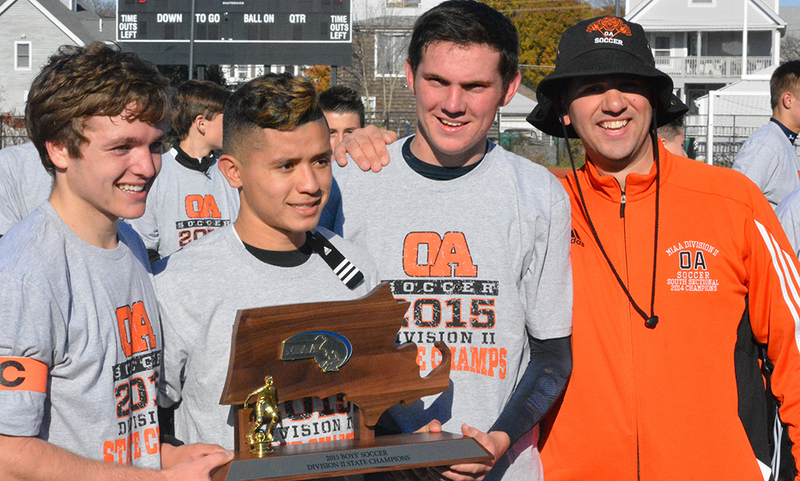 Click here to purchase photos from OA’s celebration. LYNN, Mass. – When last year’s Div. 2 state title game ended, Oliver Ames players grabbed the runner-up trophy and raised it high in celebration of reaching the program’s first ever championship game. When OA took the pitch on Saturday morning at Manning Field for this year’s state title game against Masconomet, the Tigers were not going to be happy settling for second place again. The experience of last season paid dividends. OA bounced back from an early Masco goal to defeat the Chieftains 3-1 on three well-executed set pieces and clinched the program’s first state championship. “Since we came here once, we knew how to play this game,” said OA coach John Barata. “It’s different; it’s a one-game season against a top team from the North. Masco jumped into the lead in the 12th minute. A long throw from Alex Spaulding reached Josh Polakiewicz on the corner of the six-yard box and he flicked a header up over OA keeper Jack Carroll. OA had lost the momentum after a decent start, but the Tigers utilized the experience of two straight runs to the South title and stayed in the game. Senior Chris Romero equalized in the 19th minute when the Tigers were awarded a free kick just outside the box. It may have been a harsh call, but Romero did not mind as he curled his 20-yard shot past the despairing dive of Steven Heitzelman. Just five minutes later OA took the lead. Romero played an in-swinging corner kick that Heitzelman failed to hold. The ball dropped to the foot of sophomore Nathaniel Cardoza, who was in the right place at the right time to tap it in. The Chieftains, who won the title in 2013 and have reached the state title game in three of the past four seasons (the last two in Div. 2), had their chances to equalize before the break. Shane Collins could not take advantage off of a poor clearance by Carroll to score into an empty net and then he set up Bryan Gilbert, who scuffed a shot while all alone in the box. Carroll also came through with a big save to deny Blaise Romanowski in the final five minutes of the half, tipping over the Masco striker’s close-range effort off a free kick. Seven minutes after the break, Romero showed his defensive prowess by heading out a Andrew Musiak corner underneath his own crossbar. In the 57th minute, OA sealed the title with another set piece that was straight off the training ground. Instead of playing an angled free kick into the box, Romero played the ball straight into the path of Matt Alvarado and the sophomore sent an inch-perfect cross into the box to a wide open Thomas McCormick, who nodded home the Tigers’ third. Barata credited the week of between games for allowing his team to work on set pieces and, as he explained, it “paid off” of Saturday. Romero and the rest of his teammates charged towards the traveling OA fans at the final whistle, celebrating the first state title with friends and family. The Tigers reached their first sectional title in 2013, won the South for the first time last year, and now have won the state championship. NORTH EASTON, Mass. 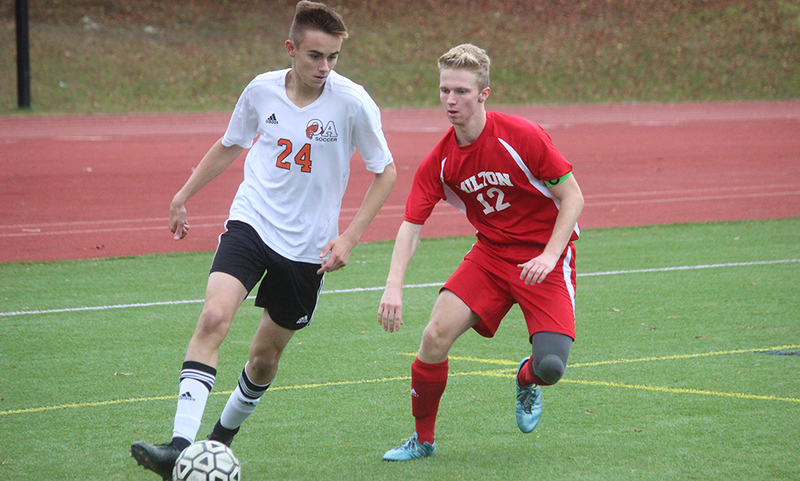 – Junior Thomas McCormick scored in the 33rd minute and Oliver Ames was able to shut out Milton in a 1-0 win on Friday afternoon. Senior Keegan Nutt used his head to flick on a ball over the top of the defense. McCormick was able to get a touch to it and get in front of the defender and rifled a shot into the net to make it 1-0 shortly before halftime. Oliver Ames came out of the gates with a good pace and applied the pressure to the wildcats. A neat combo from Max Bamford to Thomas McCormick to Cam Vella results in a shot from 25 yards out but Vella’s bid bounced just wide at the far post. Tigers’ goalie Jack Carroll was called into action 12 minutes in. Milton had a free kick from the corner of the area that was struck on goal from Josh Madden but Carroll covered his near post well to pull in the shot. Just four minutes later, Romero danced his way past a pair of defenders and unleashed a shot from inside the area on a tight angle but Milton keeper Joe Morfin was there for one of his nine saves in the game. Morfin was called into action with just over 15 minutes to play in the first half when pressure from Romero resulted in a deflected clearance. Morfin was forced to back pedal and get a hand to the ball as he was falling into his own net. Carroll had to deal with a deflection himself just two minutes later when Stefan Richardson ripped a shot from the 18 yard line that deflected off a defender. Carroll was forced into a diving save at the far post to keep the ball out. McCormick put the home side ahead in the 33rd minute and Nutt nearly doubled the lead just a minute later but Morfin was well positioned for the save. It was mostly a back and forth battle in the second half and it wasn’t until midway through when Nutt took a pass from Jack Sheldon but his bid was right at Morfin. Milton threatened just two minutes later when Madden whipped in a corner that was headed by Louis Fitzgerald but Carroll got down on the ball before a late slide. While OA registered 10 shots on target, the Wildcats had six but were limited in the run of play thanks in large part to a strong effort from Max Ahern, Jared Mallers, Cam Johnson and Bamford. In the 68th minute, the Wildcats had their best chance at an equalizer. On a long free kick, Alden Odmilson Rosa flicked the ball on and Richardson raced onto it. Before Carroll could slide onto it, Richardson touched around him and had a chance on goal but Romero was in perfect position and blocked the shot from going in. It was a good spot for Romero, who had played mostly in an attacking role for the majority of the game. Late in the second half, Barata moved him back to defense, a spot where Romero has played in the past. Oliver Ames’ next opponent will be Hingham, a team that the Tigers have eliminated in two straight tournaments, including in the D2 South Finals last year. The Tigers will play host to the Harbormen on Sunday at 5:00 at Mustaco Stadium.